I find the most beautiful things when I thrift shop. Yet, those items are not always in the color, shape or design I want. Buying a large mirror in the wrong color could be a simple update with the right paint and accessories. 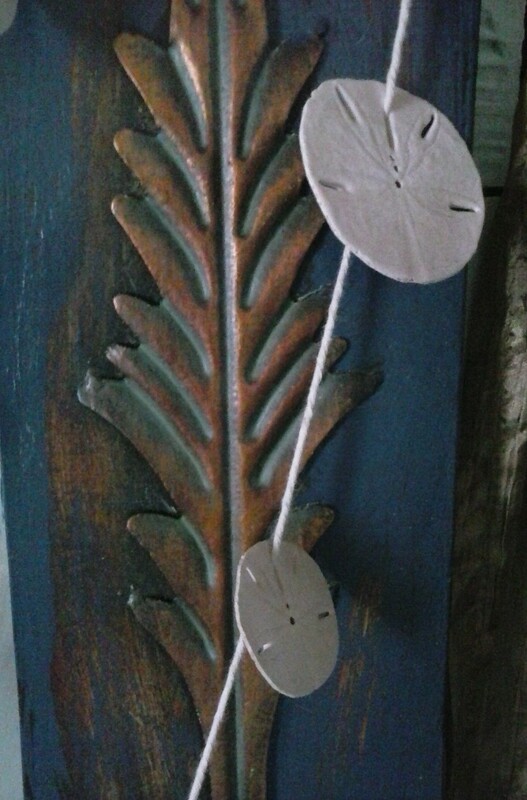 Hand painted mirror with sand dollar garland. I filled in the places with acrylic navy blue paint where the wrong color was on the mirror. Use a dry brush technique to blend the new color into the remaining colors on the mirror for best results. Closeup to dry brush technique and replacing old color with new. You’ll see a sand dollar garland I made with light weight string and small seashells. I’m a sucker when it comes to seashells of any kind. As a scuba diver I spend time taking pictures and collecting only the dead shells I find in the sand underwater. Ending any life just isn’t part of who I am. This project took less than a half hour and drying time was about the same. 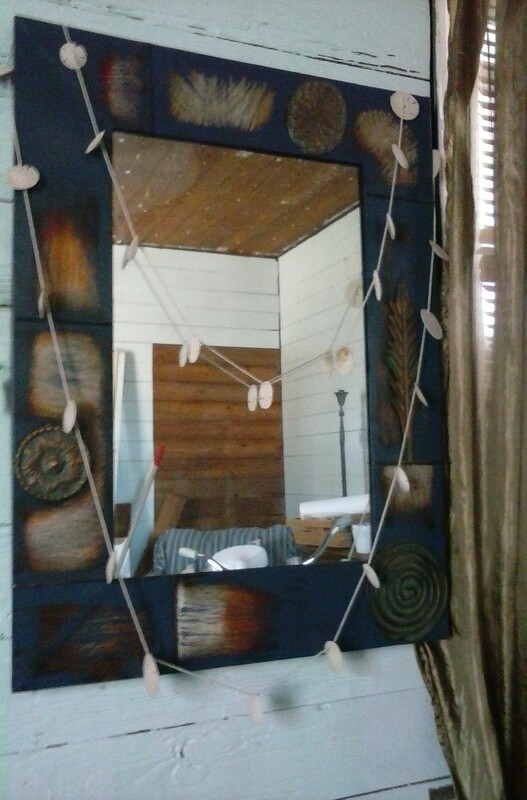 I hung up the mirror in my unfinished living room just to give the space a little color. Can you see inside the mirror where I blocked off a hallway with matching shiplap. The ceilings in the home are all bare until I get every single nail out. Whew! I Really need to paint that wall today. Vintage dresser upcycle to desk. beer. But nooooo, I have to nest and create and paint my watercolors. 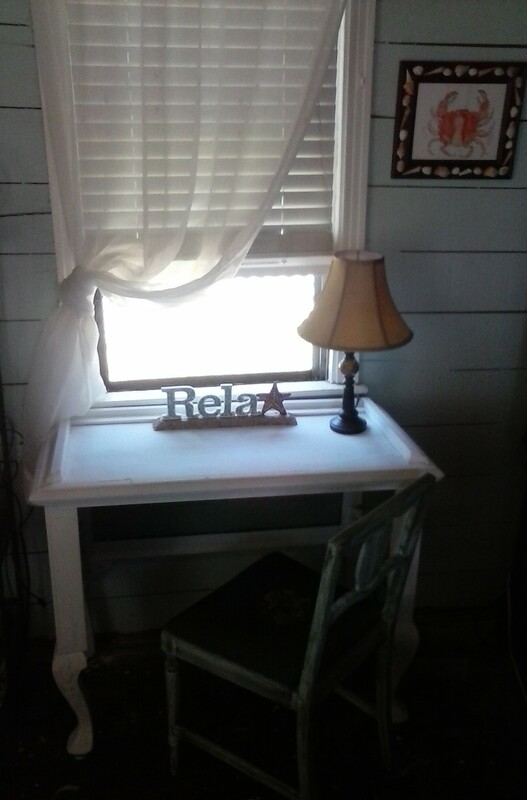 So, I plunged into a reconstruction project to gain a desk from the bottom piece of a vintage dresser. Bought this vintage dresser 2 pieces for $75. 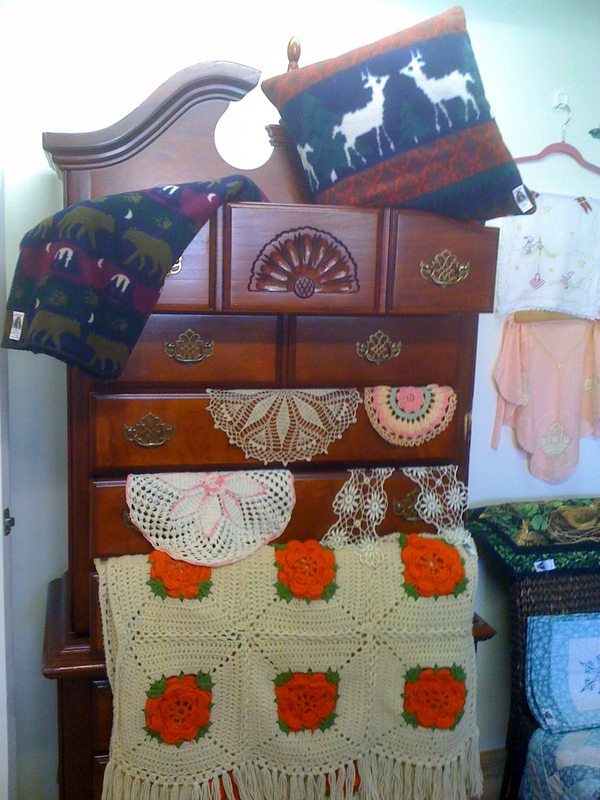 I know it’s difficult to see under that gorgeous afghan that I did buy for a friend, but there is a two drawer piece behind the roses. I took the drawers out for another project, used a hacksaw blade and gutted the piece that is now my desk. I chose not to keep any of the drawers so my legs wouldn’t get cramped in the small space. I have plenty of storage with built in bookshelves and a huge armoire in my bedroom. I shaped the legs, glued a leg back on and painted the whole piece with white chalk paint, Inside the desk I painted panels sea green to match the chair I found when thrifting for $15.00. I plan to use a dark wax to bring out the swirls on the legs…they’re very cool. Well, I have to go, my dog Reilly is using my desk as a viewing post of the cat next door…sigh. Many of my projects come from need as opposed to desire. Yesterday the new mailman was confused with the names of the individuals in the front and back house. Like most women I have two names I’ve been associated with and get mail that comes in different combinations. 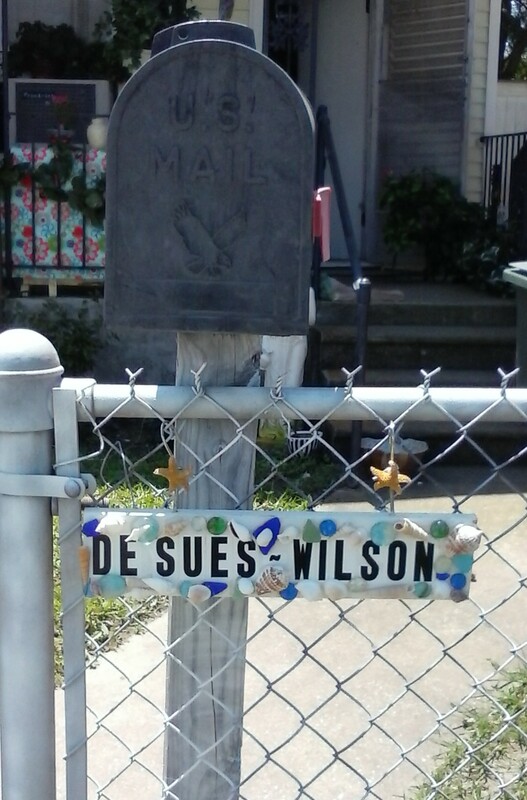 Desues-Wil or Wilson-De or, well you get the point. On top of that I’m new in the community and so is the family who rents my two story home in the back. Add to this mayhem the amount of renters that lived in these homes previously who have not forwarded their mail and the whole mail delivery system collapses at my mailbox…sniff. So I have a need to help the mail person know what my name is right away. Last night, I forged through my boxes of art supplies, seashells and hardware to fashion a sign. I found clear glue, glass beads in different sizes, seashells, and sea glass. A trip to the woodpile was successful for the sign. All I needed was something to print my name with; paint, marker, or stickers. I found some black stickers I’d purchased on a whim at a dollar store and got to work. When the sign looks more appealing than the surrounding area it’s project time! Mission accomplished, right? Oh, no…sadly, I’m renovating my two beach houses and everything looks like it could use paint or hammer and nail. Soooooo, recognizing that my mailbox, metal fence and 4X4 is drab, ancient and sad looking to my neighbors, I had to begin a curb appeal project. The front home is a shotgun style. Narrow in the width and long in the length to avoid extra taxes by taking up too much space in the width of a home, circa 1920’s laws. So many islanders on Galveston have this style with a one, two or three story home. 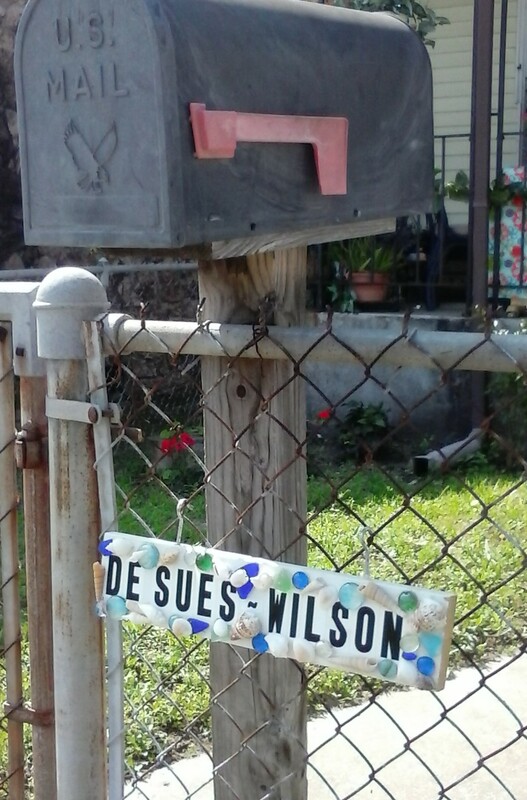 Fence, mailbox and mail delivery sign upgrade. Hi, I’m back…So after an hour of finding the three spray paint cans of white paint, applying the color to the fence and 4X4, I think the job is done for now. Oh, and I found these cute starfish shower curtain hangers I added to the hooks to hang on the fence. The wood looks like driftwood now and I really like that surprise. The fence still looks silver, but with a face lift. I plan to put one more coat of spray paint on to cover a few polka-dots on the posts. Still, my neighbor came out and loves the upgrade. Not bad for a 100 y/o home, what do you think? 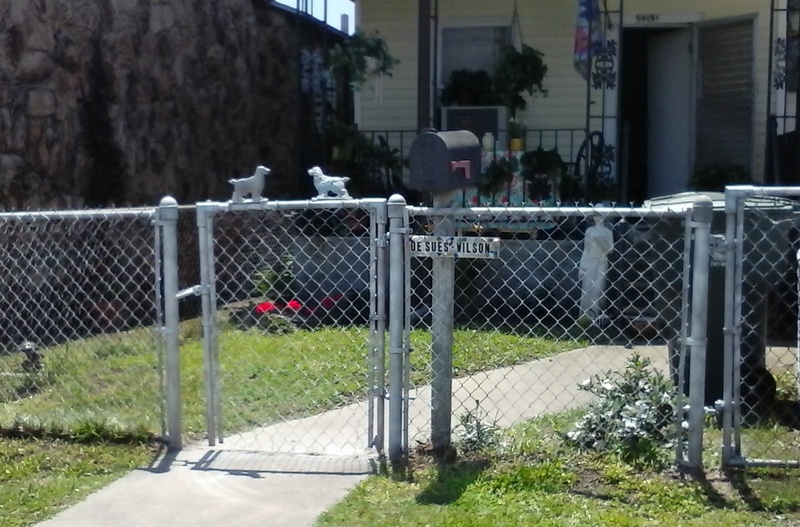 A little spray paint and the metal fence is looking much better!